Not to be confused with Hypercharge. In the Standard Model of electroweak interactions of particle physics, the weak hypercharge is a quantum number relating the electric charge and the third component of weak isospin. It is frequently denoted YW and corresponds to the gauge symmetry U(1). It is conserved (only terms that are overall weak-hypercharge neutral are allowed in the Lagrangian). However, one of the interactions is with the Higgs field. Since the Higgs field vacuum expectation value is nonzero, particles interact with this field all the time even in vacuum. This changes their weak hypercharge (and weak isospin T3). Only a specific combination of them, Q = T3 + 1/2 YW (electric charge), is conserved. Mathematically, weak hypercharge appears similar to the Gell-Mann–Nishijima formula for the hypercharge of strong interactions (which is not conserved in weak interactions) and which does not apply to leptons. Weinberg angle θW, and relation between coupling constants g, g′, and e. Adapted from T. D. Lee's book Particle Physics and Introduction to Field Theory (1981). gauge boson and the photon of quantum electrodynamics. where Q is the electric charge (in elementary charge units) and T3 is the third component of weak isospin (the SU(2) component). where "left"- and "right"-handed here are left and right chirality, respectively (distinct from helicity). The pattern of weak isospin, T3, and weak hypercharge, YW, of the known elementary particles, showing electric charge, Q, along the Weinberg angle. 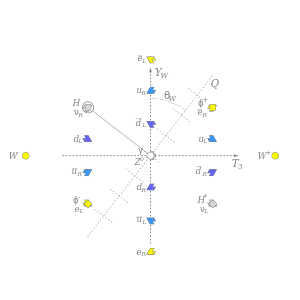 The neutral Higgs field (circled) breaks the electroweak symmetry and interacts with other particles to give them mass. Three components of the Higgs field become part of the massive W and Z bosons. Hypercharge assignments in the Standard Model are determined up to a twofold ambiguity by requiring cancellation of all anomalies. which is equal to just the average electric charge of the particles in the isospin multiplet. where X is a conserved quantum number in GUT. Since weak hypercharge is always conserved this implies that baryon number minus lepton number is also always conserved, within the Standard Model and most extensions. Hence neutron decay conserves baryon number B and lepton number L separately, so also the difference B − L is conserved. Proton decay is a prediction of many grand unification theories. Hence proton decay conserves B − L, even though it violates both lepton number and baryon number conservation. ^ J. F. Donoghue; E. Golowich; B. R. Holstein (1994). Dynamics of the standard model. Cambridge University Press. p. 52. ISBN 0-521-47652-6. ^ T. P. Cheng; L. F. Li (2006). Gauge theory of elementary particle physics. Oxford University Press. ISBN 0-19-851961-3. ^ Peskin, Michael E. & Schroeder, Daniel V. (1995). An Introduction to Quantum Field Theory. Addison-Wesley Publishing Company. ISBN 978-0-201-50397-5. CS1 maint: Uses authors parameter (link) ; Anderson, M. R. (2003). The mathematical theory of cosmic strings. CRC Press. p. 12. ISBN 0-7503-0160-0.